Introducing the SaluSpa Palm Springs Hot Tub Review for those romantic evenings with your loved one or for a fun weekend with your friends and family. Setting it up only takes a few minutes, just use the spa’s pump to inflate it, no other tools are needed. This excellent inflatable hot tub is designed to withstand temperatures of 104 degrees Fahrenheit, thanks to the 3 layer reinforced materials that it’s made of. Having fun with your friends will be memorable at all times, regardless if you’re at a barbecue party or in the mountains at a holiday cabin, or even at the countryside in the summertime, surrounded by nature, peace, solitude and relaxation. 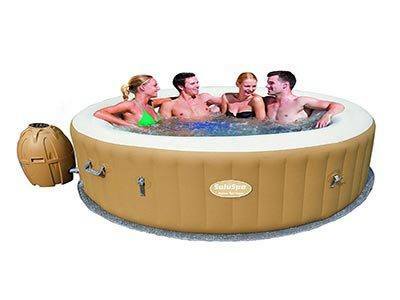 This excellent portable hot tub is designed and made out of 3 layer reinforced materials. It can withstand temperatures of up to 104 degrees Fahrenheit, thanks to the rapid-heating system that can be controlled from the easy to use digital control panel.This can also be used to control the water filtration system and power the 120 bubble jets for a relaxing massage. It also features an automatic start and stop timer heating system to save energy and control the water temperature. The SaluSpa Hot Tub has a capacity of 4 to 6 people and inflated it measures 77” x 28” which is enough to hold 242 gallons of water when full. The mellow color and leather texture makes it look great in any place you want to put it for example in the back yard right on the grass or on the wooden deck. The TriTech three ply reinforced material of polyester mesh core inside of two layers of PVC provides an enhanced level of durability and strength which cannot be found in many other similar inflatable spas. The price is somewhat in the middle. It’s not the most expensive but also not the cheapest Spa hot tub. The SaluSpa Palm Springs Hot Tub is much larger compared to other Hot Tubs, featuring a person capacity of 4-6 people and a water capacity of 242 gallons. Others like the SaluSpa Miami AirJet or the SaluSpa Paris AirJet both have 177 gallons of water capacity and the Miami only has a 2 to 4 person capacity. It can be installed quite fast, using the best air pumps that comes with it, no other tools being needed; in about 10 minutes it will be ready for water administration, which also takes about 30 minutes to fill up, depending on the water source. No matter if you are a new user or if you don’t have any expertise in hot tub, you will be able to do the task with a few simple steps. If you want to use the hot tub for a long time, it is highly needed a perfect maintenance. But you can stay tension free when you have this SaluSpa Palm Springs AirJet Inflatable Hot Tub. It is very easy to maintain, not a lot to do with this Hot Tub, just clean or change the filters add some chemicals and you are good to go have some relaxing time. The SaluSpa Palm Springs Hot Tub is good for the whole family, starting from k﻿﻿ids to elders, no matter if you’re having a party, a romantic evening or just some relaxing time of your own. The kids will love it because it’s the perfect place to play with floating toys like battle ships or remote controlled fish. It will boost their imagination and will keep them busy for hours. It’s good for parents as well. This is a good way of spending a romantic evening with the spouse away from anyone else when the kids are away on holiday with their grandparents. For Teenagers and students, it’s the perfect way of enjoying a hot summer day with all your friends over at a party. For elders it’s even better because the massage that the bubble jets offer is very good for rheumatism. The SaluSpa Palm Springs Hot Tub is good for business as well, if you are a Hotel owner and you don’t have money or space to build a pool or a large Jacuzzi for your customers, this will be the perfect replacement as it’s good for the pocket but very relaxing and enjoyable. Soft touch control panel; you need at the touch of a button. Adaptable to any place or weather. Auto shut off feature to save power. You may need to buy inflatable cushions that fill with water as this Hot Tub does not feature inflated bottom which can be annoying for shorter people. Because the heater is so powerful you cannot have both the heater and bubbles on at the same time, which can be annoying when you want to have a massage and the water temperature decreases rapidly. Question: Is this hot tub make a lot of noise? Answer: Nope, this product doesn’t make a lot of noise when you are using it. But when the bubble produced, it may make some loud which is not annoying. Question: How to make this Hot Tub empty for moving one place to another? Answer: There is a hose included with this hot tub. You need to just connect the hose with the tub to make empty the tub. Use a proper place to flow the water there. Question: What about the warranty? Answer: There is a one year warranty on the leakage of the tub. But you can stay secured about this tub for a long time without any major issues. In conclusion, I must say that the SaluSpa Palm Springs is hands down one of the best inflatable Hot Tub money can buy and it’s not a lot of money since we’re talking about it, compared to other Hot Tubs it’s large enough for the whole family or a couple of friends. It will look great where ever you put it and you can install it in the basement or garage when the weather outside is cold.